For the first time in history, you can audition with our Banana Nana to join the ranks of the legendary performance troupe – the Banana Nanas! Our Nana will teach all potential Nanas a dance, similar to the style of dances seen on the field. The Nanas learn their new dances and practice weekdays during the day, so please make sure you are available to rehearse with the team if cast! Guaranteed entry to home games when performing, reserved seating, and all the fans you could ever want. Are you ripe enough to be a Nana and are finally ready to show the world the star you were born to be? We’ll see you at auditions. Gentlemen, listen up. This is a call to action, a sounding of the alarm, an invitation to the party. 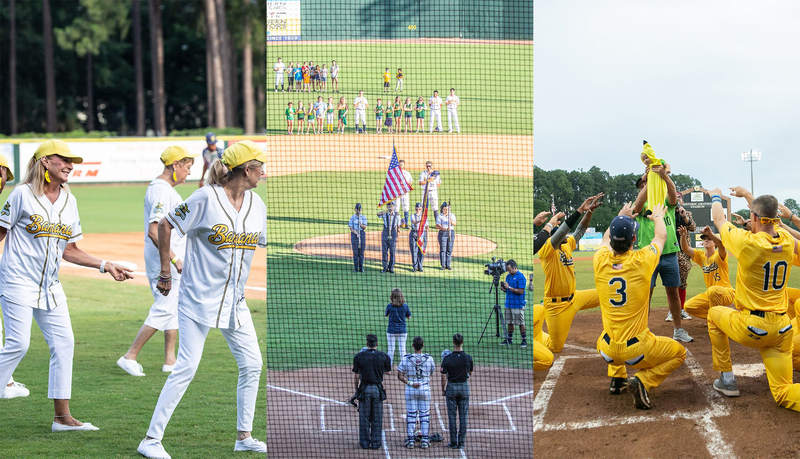 The Man-Nanas is the exclusive Savannah Bananas all-adult-male cheerleading team. Men specializing in embarrassing their kids/spouse (or themselves) are a must. The Man-Nanas will perform on the field as well as lead cheers throughout the grandstands. The Man-Nanas will harness and direct the energy of our fanbase. Come to auditions to learn a basic routine and to show us your energy! We want your help to turn the energy up to an 11 out of 10. Stop by anytime during auditions on Saturday, April 20th to audition to be a National Anthem performer – or to nominate your Baby to be an official Banana Baby! Are you, or is someone you know, an amazing singer? We want to show the world! At auditions, you’ll simply be asked to sing the anthem on video. That’s it! For Banana Babies, parents (or soon-to-be parents) can come out to auditions with their children (if possible) for an on-camera interview! Brace yourself for some silly and fun questions, as we attempt to find the most amazing Banana Babies possible. Attention rockstars! The Director of the Banana Band, Sean McBride, will be holding open auditions for student musicians for the 2019 season. Anytime from 1-3pm, high school students can audition by performing a 60 second selection from any piece of music they choose. High energy music is encouraged, but not required. If you can rock your instrument, we’ll hook you up with rockin’ music. The Banana Band is looking to add to its next wave of musical masterminds, and we want you to be a part of it. If you know you would like to audition, but cannot make the sessions on April 20th, please email Will@TheSavannahBananas.com to see if it’s possible to submit a recorded audition tape for your desired role. Interested in auditioning? Fill out the form below!